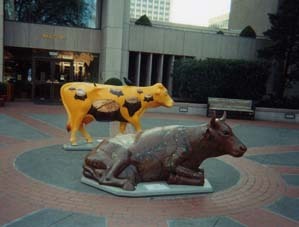 It stands in all its bovine glory in the plaza of the Oregon History Center at SW Park and Madison, a yellow fiberglass cow with birds perched on its back. It is one of a herd of 108 cows unveiled on April 1st as part of Kows for Kids, probably the most dynamic public art and fundraising project ever to hit the streets of Portland and one that will turn this town into a regular cow town for most of the summer. But this cow is just a little different, a bit special. Called the Stumping Grounds Cow by artist Lee Musgrave who painted it, this cow was sponsored by Donald and Chrissy Washburn in partnership with Dignity Village, a recently incorporated tent city presently renting part of a City leaf composting site known as Sunderland Yard. Villager Tara, who is part of Dignity's neighborhood outreach team, describes the cow this way: "It's our stump cow," she says, "It's got stumps painted all over it. It signifies homelessness because the birds are looking for their nests." She is quick to point out, however, that the birds on the Stumping Grounds Cow's back are not quite homeless. On two of the stumps are two tiny birdhouses. Dignity Village is proud of its sponsorship of the Stumping Grounds Cow. It is felt by villagers that the $1,000,000 Kows for Kids hopes to raise will help Portland's 1,500 homeless street kids. To learn more about the events Kows for Kids has planned for its cows over the next couple of months, check the Kows for Kids' Web site at www.kowsforkids.com. To learn more about Dignity, check the village's Web site at www.dignityvillage.org.